As was mentioned in the discussion of the rolled fabric doll kits, the Mordecai House in Raleigh, North Carolina, had a display case containing a collection of rolled fabric dolls from the 1850's. Among the dolls in the display case were four black dolls. Be sure and read a bit about the history of these dolls on the previous page about the Rolled Fabric Doll Kit. One element that we did not mention in that description was the beginning of the instructions for making the black doll. 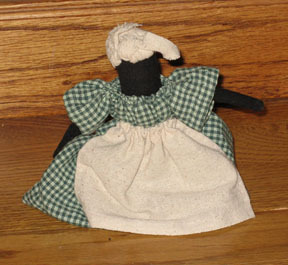 The instructions began with an explanation that the black doll was made "just like the doll on the previous page." Probably without intending it, they made a very strong statement for equality! And, like our other dolls, be sure and name your doll. We have not pre-named them because you may have some special name to give them.